Can we make reservations "online"? No, but you can email a request with the information found on our "Reservations" web page. We require a non-refundable deposit for holiday weekends, you must call us for availability and secure the campsite with a non-refundable deposit. We disconnected the "Online Reservations" due to size and the RV's required amperage rating. Check-Out is Before 2 PM. As the sites may be occupied before or after your stay, please adhere to these times. How late can we check in? We prefer all campers to be checked in by 11:00 PM on Friday/Saturday nights and by 10:00 PM Sunday through Thursday. This reduces the chance of disturbing neighboring campers. How many tents can we set up on a campsite? We allow one (1) tent per campsite. We will allow a second tent to be set up for the registered campers dependant children under 18 years of age. A Maximum of 1 week for tent camping. How many people can we have on a campsite? Our policy is One immediate household family which include 2 Adults and their dependant children. We allow 1 vehicle per site. Other vehicles MUST be parked in an overflow parking area. Our Electric only sites vary in size but can only accommodate tents, Pop-Ups and Trailers up to 24 ft.
Our primitive campsites were made larger as to put space between campers. Though the sites are large, our tent/vehicle policy still applies. What does the Full Hook-up site include? Our Full Hook-up sites include Electric, water and a sanitary connection. Why don't you allow RV's over 40 feet long? Leisure Time Campground was built in 1965, They didn't create campsites nor the roads to handle the larger RV's of today. As a courtesy to our guests, we limit the size of RV's to ones that will fit into a campsite and able to navigate our gravel roads. We have (4) full hook up sites that can hold 36-40 ft RV's. If your RV is 36ft to 40ft long, we suggest having reservations to assure one of these sites. Why do you charge for WiFi? Basically, because it works! We have spent thousands of dollars in equipment to offer WiFi to our guests and feel we should be able to recover some of the costs. Our system is designed for Email and web browsing only due to the broadband we can receive from our ISP. Video streaming is discouraged and the system will adjust speeds automatically depending on the number of users on the system to make access equal for everyone. When Temperatures are above 70 degrees. The pool is open to the Public Sunday Through Friday 10AM to 6 PM. Do you have a dump station? Yes, but, it is only available to our camping guests. Since we are on septic systems, we do not allow outside campers to use our dump station. A dump station is available at Lafayette Trailer Sales Monday through Saturday. Also keep in mind that many Flying J fuel stops also offer dump service. Do you offer any type of refunds? No, Camping is an outdoor recreation, we do not offer any refunds do to the inconvenience of nature, early departure, eviction or reasons beyond human control. Do you offer discounts? We have decided not to inflate our rates to offer discounts to a limited amount of campers. Instead, we price our sites comparable to other campgrounds based on size, location and amenities. Can we run a generator? No, We do not allow generators to be operated on the campground. We have sites with power available if needed. Other guests do not want to listen to a running generator. Do you have a boat ramp? 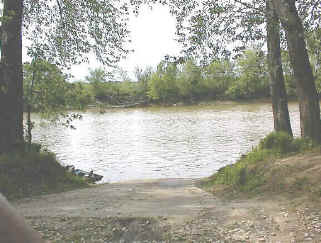 Yes, Our boat ramp can handle most river (flat bottom boats) without any problem. The ramp is fairly steep but has not been a problem for most guests. We do not allow non-campers access to/from our boat ramp. A public access to Americus is located at the Grant Street Bridge. We do not charge a boat ramp fee to registered campers. Can we leave our boats in the river? We do NOT recommend leaving your boat or anything of value in or near the water. The Wabash River is a Federal River with many public access points. Remember, There are no easements on a Federal Rivers. Do we need a fishing license to fish? Yes, fishing licenses are required. See the Indiana DNR site for additional Information. Do you sell bait? No, But there is a Gas Station located at the entrance of the campground and they sell bait. We do sell some common fishing supplies. There is also a Sporting goods store near I-65 (Arrows III) We do NOT allow access to the Gas Station for river goers, use the Grant Street Bridge access. What activities do you offer? We have an activity scheduled for every weekend throughout the season. Click on Weekend Activities from the left menu. Why are non-camping guests charged a fee to visit us? You as a camper have paid to use our facilities. Your guests are using "our" facilities, drive on our roads and are an added liability to the campground. We are here for our campers, not their visitors. If the visitor wants to stay later than 10 PM then they should rent a campsite by 8 PM. We have read mixed reviews concerning your campground n the Internet We service over 10,000 guests each year. It's impossible to please everyone that visits us, we do our best to offer a campground with recreational activities. Thou some people feel certain rules do not apply to them. We apply our rules equally amongst our guests and unfortunately some people feel that we are too strict when they break our rules and post negative comments. Remember, there are always 2 sides to each story. Are Golf Carts allowed? Yes, BUT, the camper MUST provide us with a copy of the insurance policy with the golf cart listed PRIOR to unloading the cart. Golf Carts at campgrounds are NOT covered under your home-owners policy. Golf Carts Rules are strictly enforced. Is Alcohol allowed? We allow responsible drinking for guests over 21 years old. But Remember -- Get Rowdy --- Get Gone !!! We do NOT allow Glass bottles in the recreation room or the swimming pool area. If you bring glass bottles, please be sure they go into the trash. You will also be required to keep the glass bottles in YOUR own campsite. Why do you discourage the use of glass bottles? Safety! We do not want any of our guests to cut themselves on broken glass. Glass Bottles also "cost" us time and money. If you miss picking up a bottle, a child will most likely find it and break it! We have also lost a few tires while cutting the grass. Therefore we discourage the use of Glass in any campground environment.